Welcome amateur astronomers! Here you'll find resources to help you make meaningful connections with Girl Scouts and help them earn their Space Science badges. Girl Scouts of the USA recently released Space Science badges for girls in kindergarten through fifth grade—and in 2019, they’ll offer Space Science badges for sixth- through twelfth-grade girls. Earning each badge includes an “observing” component, with troops encouraged to reach out to local astronomy clubs, so be aware that troop leaders may contact you to attend one of your club events. You can share your love of the sky as you help girls unleash their G.I.R.L. (Go-getter, Innovator, Risk-taker, Leader)™ potential! Learn about the Girl Scout Difference and how the Girl Scout Leadership Experience helps girls thrive. Take a test designed by Harvard on Gender and Science to learn more about your own biases. Everyone has them; find out about yours. Learn tips to do more inclusive outreach. Stay tuned as we put the finishing touches on new activities! The Astronomical Society of the Pacific is offering workshops aimed at doing great outreach with girls. Here are some of the upcoming dates. To find out more or to schedule a free workshop for amateur astronomers, contact Theresa Summer. 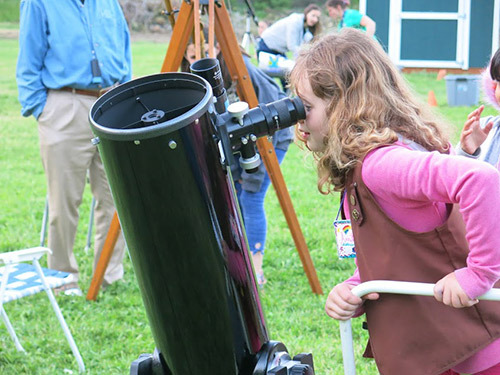 If you are a Girl Scout Volunteer looking for astronomers, find your local club here. Upcoming workshops and presentations - join us! Online workshops coming spring 2019! Past workshops include Ohio, Missouri, SF Bay Area, and RTMC in S. CA. Resources to come - stay tuned! Read more about the work in progress here. One of the ways to encourage girls in astronomy is to approach your outreach with a "growth mindset." Find out how in this article. This video on young children and this one on pre-teens remind us that girls can do science and that the playing field isn't always level. We all affect the people we talk with. See what society tells these girls and what you can do to change your part in that. Show girls just how much women do at NASA with this video. Do you have other resources you think should be included? Let us know! Night Sky Network members bring astronomy to the public! Find clubs and events near you on the NSN locator page. The NASA Night Sky Network is managed by the Astronomical Society of the Pacific. The ASP is a 501c3 non-profit organization advancing science literacy through astronomy. Want to learn more outreach tips? Check out these videos. See how early unconscious bias begins in this video from the BBC.